Look at how even the shoulder blades are now! Compare to spine page pics! Sitting around doing nothing sure is tiring! Check out my purple cast! 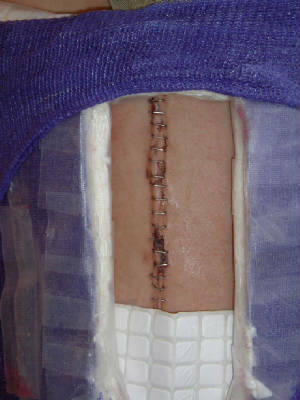 The entire incision, six weeks post op, all 9 inches of it! 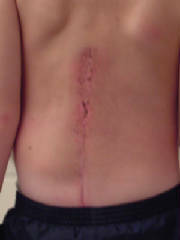 Incision four months post op :) No more brace needed! 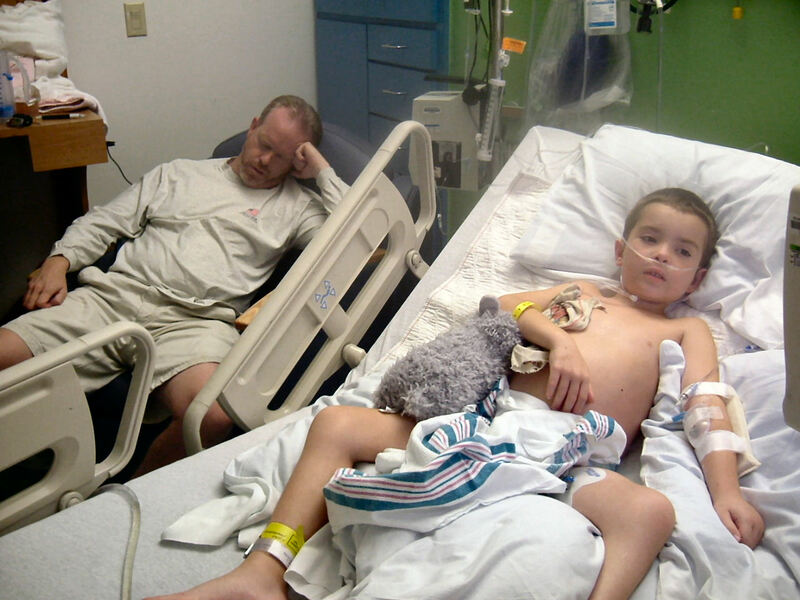 Billy was in surgery for about seven and a half hours, they did a release of his retethered spinal cord and then the fusion. 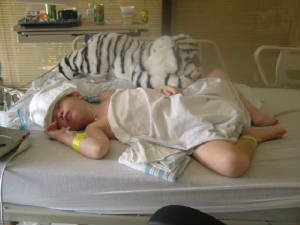 He spent the first night in the ICU while we played around with medications to get him comfortable. He had quite a bit of muscle spasms and needed ativan in addition to his pain medications to settle him down, and the morphine depressed his breathing a bit so we had to use a nasal cannula to give him a little extra oxygen to keep his sats up. He recovered fairly quickly after that first night, and we only spent six days in the hospital. He was released, after being casted on the fifth day to allow time for swelling to go down. He did have some intense phantom leg itching and sole of foot pain that was most likely due to his retether release, and he took neurontin for three weeks postop, along with his morphine. 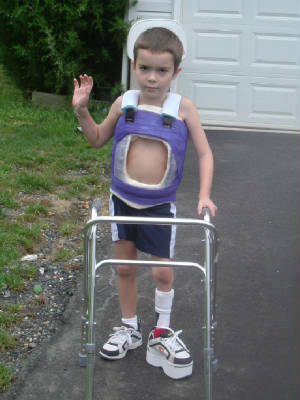 At about two weeks postop, he went outside and started walking for the first time (the leg discomfort and pain in the soles of his feet kept him less active than normal). 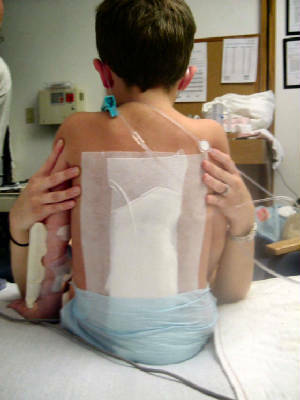 About six weeks after the surgery, we cut off the cast and were fitted for a Wilmington TLSO (thoracolumbosacral orthotic), pictured above. This type of brace is very light weight and meant to provide stability to the thoracic, lumbar and sacral regions of the spine. 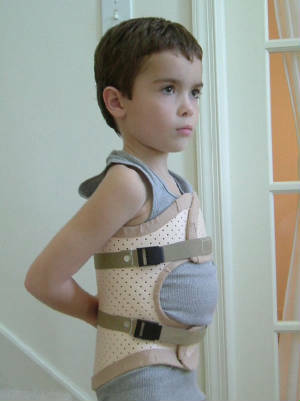 The brace prevents twisting and bending, helping to immobilize those areas. Hopefully this will protect Billy's spine as the new bone begins to fuse and until it is of sufficient strength to withstand his ordinary motions. 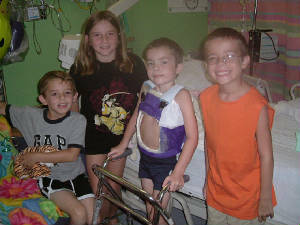 He was much more comfortable and independent in this brace than he was in the heavy bulky cast. 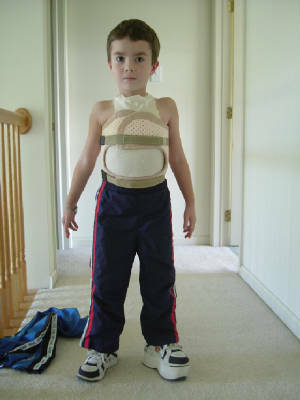 Billy wore the brace until he was off for Christmas break from school, and was able to go back to school without it in the new year. He was about four months post op. It was pretty scary at first, I was so paranoid he'd be bumped or twist too much, but nothing happened. We saw the doctor for Billy's six month checkup and the spine was fusing nicely. He still can't jump, bounce, twist hard or play contact sports until a year postop. Then at a year, he was released from all restrictions except contact sports and hanging from his arms. He is doing wonderfully now, has regained almost all lost mobility (socks and shoes were a challenge for a while! ), and has had no complications from the surgery! Due to the fusing of eight levels of vertebra (they will not grow anymore), Billy will probably lose about 2.5 inches from his final adult height. However, if you look at the CAT scan pictures of his spine/pelvic junction and how unstable it was, that is a small price to pay for having it all fixed and not worrying about it as he gets taller and heavier. 2011 update - the spine fusion still looks great, and the ortho finally let me know how worried that he was that it would not be successful on the first attempt, haha. Easy for him to admit now that it has worked, and I'm glad I didn't know the extent of his concern. As for only losing the predicted 2.5" of height, I'm a bit worried about that, as it looks like we've already lost 1.25" (measuring height vs. arm wingspan) so far at 11.5 years of age, and no sign of pubertal growth spurts yet. I'm thinking it will end up more, but the surgery needed to be done, so not much I can do about it. 2019 update - It's been a long time since I've updated this, so it's long overdue. Billy is now almost 19, and has reached his full height. Comparing his wingspan (fingertip to fingertip), it looks like he's lost between 4 to 4.5" of height in his torso from the fusion. 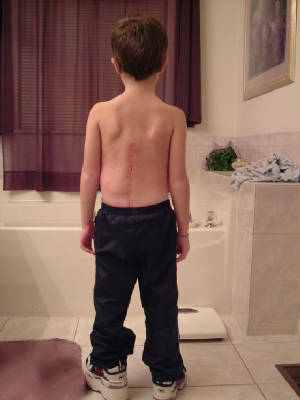 He did have a curve grow above the fusion during his pubertal growth spurt, but it stopped and has remained stable and doesn't affect him. The lack of extra torso space can leave him a bit breathless and uncomfortable after eating too much, but other than that it hasn't caused any real issues. His pulmonary status is good. 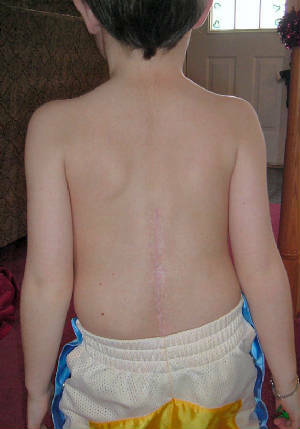 Twelve years after the surgery, his back is pain free!